Much as I love spring, its a season that's hard on the hands. 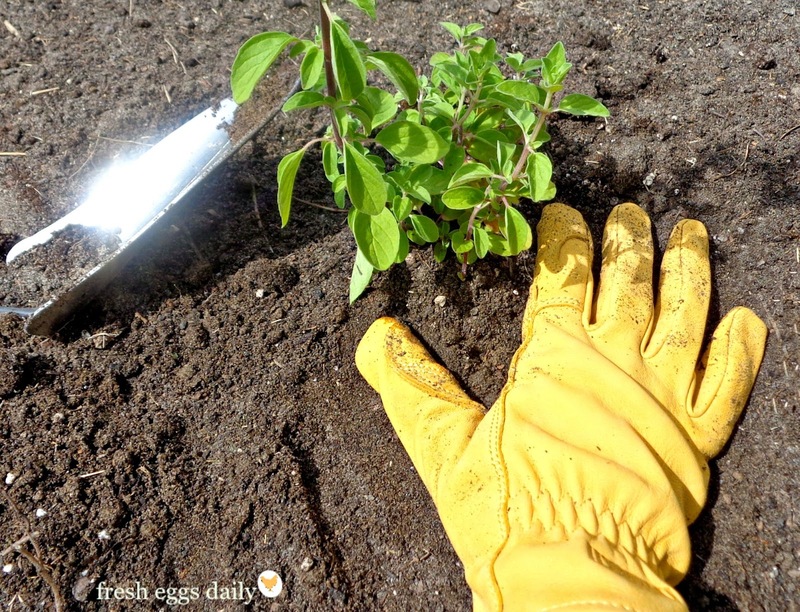 All the cleaning, and mucking out stalls and chicken coops, gardening and outdoor work turn my hands dry and cracked, instead of soft and smooth. So I'm left with hands (and often feet too!) that need a little TLC after a long day of working outside. 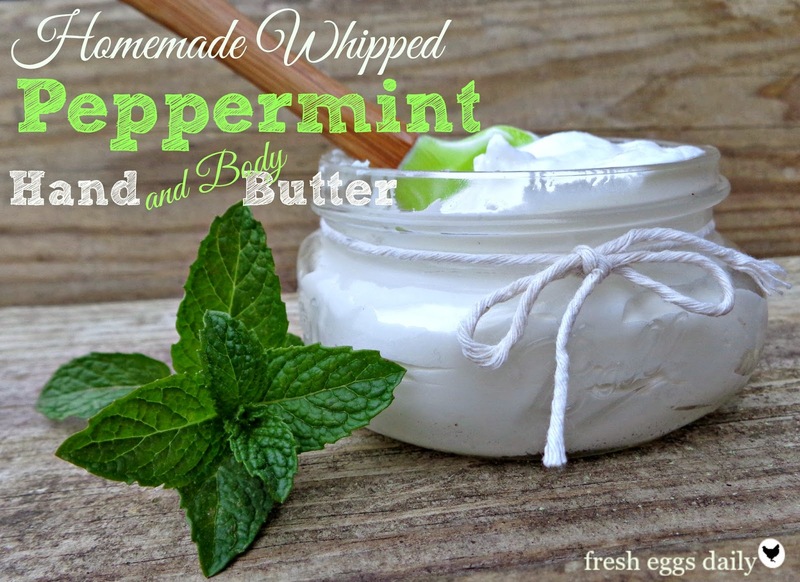 I love to whip up a batch of this smooth body butter to slather on all my rough, hard-working body parts. 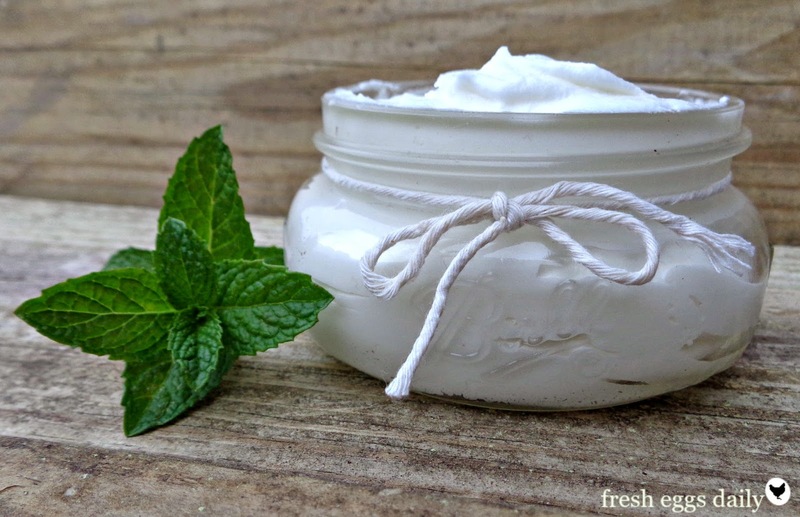 I love to use peppermint essential oil because the scent really wakes me up and keeps me going about my day, but feel free to substitute, say lavender for a wonderful bedtime butter, or any scent of your choosing. The butter goes on smoothly and absorbs into your skin, leaving it soft and silky. Easy to make, you can have a batch ready in no time at all. Add the butter and oils to a glass measuring cup set in a pot of simmering water over medium-low heat, using a wooden chopstick to stir until completely melted and clear. Once cooled, blend the oils with mixer on low speed, then increase the mixer speed until your 'butter' starts to look like whipped cream and stiff peaks form (this will take several minutes). Add the essential oil and Vitamin E oil and blend for another few seconds to combine. Scrape the butter from the bowl and smooth it into 4-ounce mason jars to store. Apply liberally as needed for a softer, smoother you! How long does it last before spoiling and how is it stored? I just leave it on the bathroom counter. I don't know how long it lasts, but I can almost guarantee you'll use it up way before it goes bad. The Vitamin E oil is a mild preservative, so I would guess a few weeks.